Current events in France (#10) To better understand a country, it is useful to read its press and watch its TV. You can see what are the main issues for the people, what are the current controversies (the French are very good at that...). In this section, I try to describe with more detail, the main topics for the French. WARNING ! The comments below do NOT reflect MY own opinion but are a tentative synthesis of what comes out from the French press and TV in a given month ! I do express my own opinions on page Editorial ! 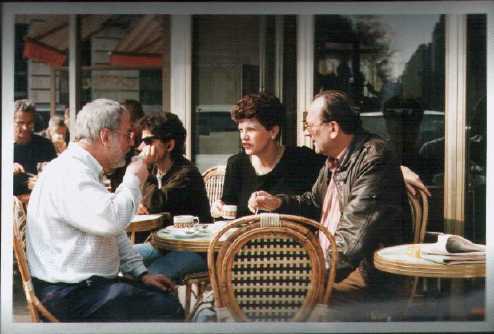 Webmaster Philippe Rochefort and wife Harriet, with a friend, discussing current world affairs in a French bistrot. improve life outside the big cities. Taken aback, the government proposed after a few weeks the organization of a major national debate, where everyone could present their problems and propose solutions. For two months the government organized a giant debate: more than 10,300 meetings, with almost two million participants and more than 200,000 proposals! But, at the end of the debate (March 15, 2019), it was clear that the Yellow Vests had refused to participate in the debate and any official meeting with the government, had excluded any of their members who had appeared somehow like a leader or a spokesperson and refused to constitute a list for the next European elections (in May 2019). It was a spontaneous, unorganized movement, offering no interlocutor to the public authorities, which refused all legal obligations (for example, in France, all street demonstrations are allowed, provided that they have been previously declared to the police, who take the necessary steps to ensure that they can take place peacefully). The demonstrations, which have taken place every Saturday since early November 2018, have therefore become increasingly violent and public support has decreased to 40% but the movement did not stop.